Two months from today, Mom and I will be headed on a road trip! where we will be taking a two day wool applique class with Maggie Bonanomi! Maggie will be teaching three classes - two for wool applique and one for rug hooking. I always feel like each class project is the best one yet! We will both be so happy to return to Wheaten Woolens in Davenport, Iowa. It is truly a paradise - especially in the summer. as Beth Anne has a fabulous inventory. And I am sure we will find some other treasures as well. Then you can start counting the days along with us. It is a place that is hard to leave, but I am so glad that "Garden Rabbit" hanging on the door is also on my kitchen table as we speak. A wonderful reminder of a wonderful place. Later, he led them out as far as Bethany, lifted up his hands, and blessed them. While he was blessing them, he left them and was taken up to heaven. They worshipped him and returned to Jerusalem filled with great joy. They were continually in the Temple, blessing God. 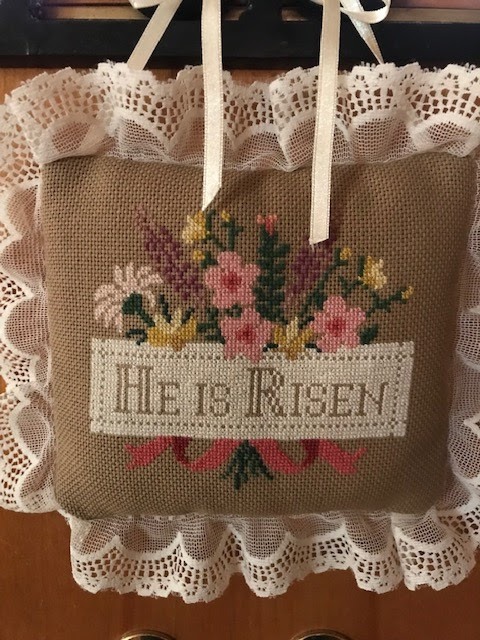 I have been stitching away on Easter/Spring projects. Some have stitched up quite quickly. With tax time and all, I have not had time to fully finish any. I am hoping to find some time to fully finish some this holiday weekend. 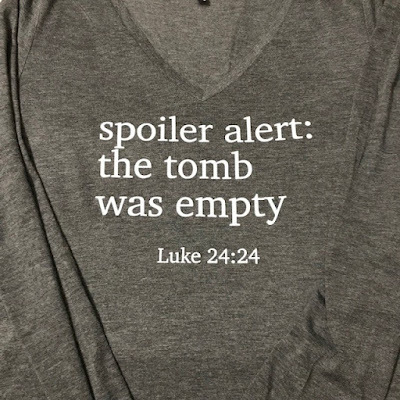 I just had to share my new shirt by Elly and Grace! I love it and it's so comfy too. and the curtain in the sanctuary was torn in two. “Father, into your hands I entrust my spirit.” After he said this, he breathed his last. Quilt Festival Chicago last weekend. They had a fabulous exhibit of quilts by Edyta Sitar of Laundry Basket Quilts. of the Bittersweet Stitching Sisters. 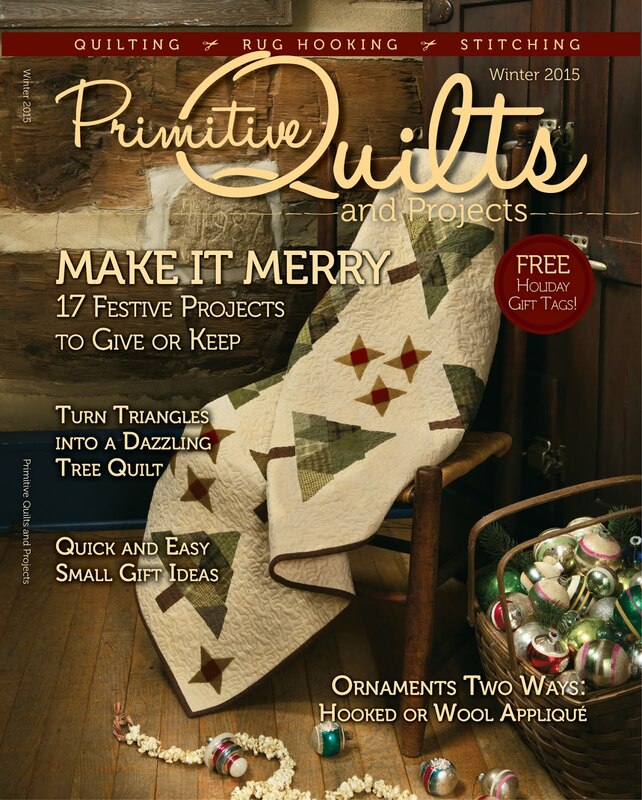 And the absolute best in the Primitive Quilts section! Love the free bag we received from Rainbow fabrics! I tried so hard to be good and limit my purchases. I think that I was pretty good. I did buy two new wool patterns. Love the Clipboard Quilt Series! Lori Smith had a booth and let me just say that these are even more gorgeous in person! I love Kai scissors so much that I decided to try one of their rotary cutters. I liked the small size of this one. Rag Spun Studio had the best buttons! Can you believe that the buttons on top are made of leather?! I had two favorite booths at the show. They go around the world to find the best artisan made notions. The pins above are blown glass with tiny flowers - made in Japan. The teeny scissors were made in Italy. The spool is a magnetic needle/pin holder. And the little button is also a magnetic needle holder. I used my hand to show their small size. Mom bought a spool as well. Our other favorite booth was Epicurean Boutique. I think we could have spent all day in their booth! I was good and didn't buy anything, just enjoyed the inspiration. Unfortunately I didn't take pictures of Mom's purchases there. But let me just say their booth was amazing! I sure enjoyed Mom's birthday ;) and hope that she did too! April Stitch from My Stash Projects. This was a class at the 2018 From Our Hands Creative Retreat. I didn't take the class as I had a conflict, but was able to purchase the kit at the Mercantile. was released and purchased in the Spring of 2017! Yep, after two years, I am finally going to stitch and finish it. 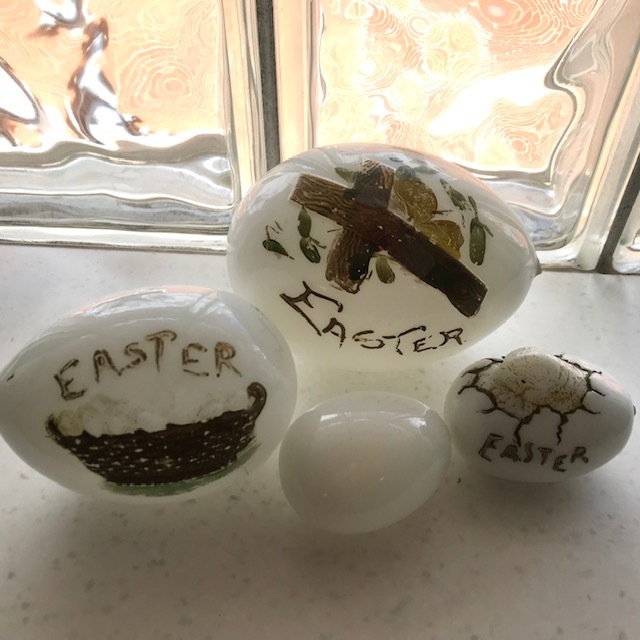 I am hoping that these two projects will be quick as I have recently bought several new Easter/Spring cross stitch charts that I am really itching to stitch! But I must Stitch from my Stash first! "Rabbit & Hen Wall Quilt"
I started this last year - you can read about it here. And purchased I purchased it back in 2016 - here. Well, now is the time that you have been waiting for! Thanks so much to the 37 people that entered my little giveaway. It was so fun to read all of the comments.You all had very logical ideas of the color that I have 10 skeins of - Carriage Black, Black Crow, Harvest Basket, Dried Thyme, Oatmeal - all common colors that I would have guessed as well. What was the color that I have 10 skeins of??? Don't ask me how that happened - I really have no idea LOL! Since no one guessed the color, I used random.org to select a random winner. The winner is #23 - Simple Pleasure! Patricia, please send your mailing address to me at pgagliardi9@hotmail.com and I will get your skein of Mulberry and a few other treasures on their way to you. The other question was how many skeins I have of Gentle Arts Sampler Threads in my box. The guesses ranged from 65 to 262. If you promise not to tell my husband , I'll share - 357 skeins! Oh my! kcmrugs - you won closest to the number with 262. Please send your mailing address to me at pgagliardi9@hotmail.com and I will get your skein of Mulberry and a few other treasures on their way to you. Please respond in the next week so that I can get these sent out to you both. Mom was here over the weekend. She was kind enough to help me organize my Weeks Dye Works. I've also started collecting Classic Colorworks and will keep these organized from the start lol. Thanks again for joining in my giveaway - I'll have another one again soon.